Circle, Coven & Grove--It's Baaaaackkkk! Last weekend, I went to the RoberCon Science Fiction convention in nearby Binghamton, NY. This is my report. Short version: IT WAS A BLAST. What, you wanted a little more detail than that? Okay. First of all, I got to spend much of the weekend meeting and then hanging out with one of my favorite authors, Tamora Pierce. Amazingly enough, she seems to think I'm pretty cool too, and loves the Baba Yaga books! Oysters Rockefeller! One of my favorites. They were delish. This is me at the end of the day on Sunday. Cons are exhausting. You just never know who you're going to meet! My friend Robin and my goddess-children Nate and Sophie live nearby, so they came too! But this year is going to be even better, because the Guest of Honor is one of my all-time favorite writers, who I've never gotten to meet in person before--Tamora Pierce! Soooo excited to finally meet her! Plus I get to moderate her chats on both days. On Saturday I'll be taking part in a panel with Tamora and some other authors on "Writing strong women," and then doing the first chat with Tamora at 2 followed by a group book signing at 3. On Sunday there will be two more panels (including one I'm really looking forward to called "Something about magic") plus another chat with Tamora. And of course, I'm going to get to hang out with a bunch of very cool people, including writer pal Nancy Holzner and best friend Ellen (aka "The Entourage"). There's something for everyone at this convention--gaming and cosplay, panels on Doctor Who and Star Wars, and generally geeky goodness. If you live anywhere nearby, I hope you'll come see me! I promised that when the blog reached 400 followers, I'd do another giveaway...and this week we hit 403, so here it is! Addendum: Some folks are having a problem finding the places to follow. I hope this makes things clearer. If you go to the top of the blog page and look to the left-hand side of the page, there is a large form to fill out that says "Subscribe to my mailing list." A little bit under that, still on the left side of the blog, under "Total Page Views" there is a space that says "Follow the blog by email" where you just enter your email. Further down (to the left of the contest form itself) you will see a place where it says "Followers" and underneath that there is a blue button to click on that says "Join this site." Underneath that, you can see pictures of all the people who already follow. Don't worry if you already follow here, etc. You still get credit! I appreciate the heck out of everyone who shows up here. I decided to come up with a fun Baba Yaga dragon themed giveaway this time--take a look! There's a dragon greeting card with original artwork from my shop (personally, I'd frame it instead of sending it out, but if you win, you can do whatever you want!) and a dragon necklace, plus a broom pen and a couple of mini-notebooks, some bookmarks and postcards. What do you think? I just want to thank all of you who show up here (and elsewhere) and support me. It means more than I can say. Now let's see how many followers I can get up to before the contest ends at midnight on Sunday! Mabon, or the Autumnal Equinox, falls on Wednesday September 23rd this year. The equinox is only one of two days during the year, the other being the Spring Equinox (which will happen on this day in the Southern Hemisphere), when there is an equal amount of night and day. This makes these holidays the perfect time to work on magick for balance in our lives. I don't know about you, but this is an issue I struggle with all the time. Here is the spell that I wrote for Blue Moon Circle to use during our ritual. Maybe you will find it helpful too. Magic the Cat, waiting for the feast to start. Spaghetti squash out of my garden, topped with homemade pesto, tomatoes, walnuts, and cheese. YUM! 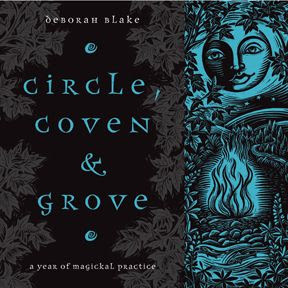 I have good news for those of you have been asking me how you can get a print copy of my first book, CIRCLE, COVEN & GROVE, which went out of print a couple of years ago. Llewellyn has just re-released it in print, and it is available at AMAZON and a bunch of other places (plus you can now ask your local Indy bookstore to order it for you). Of course, it is still out in Kindle form with its cool Mickie Mueller cover from me, too, HERE. I'm admittedly pretty happy to have it back, in part because I always had a soft spot for my first baby, and in part because this means I can say that all my books are still in print, which is kind of cool. Do you have a copy in print? Or as an eBook? Or are you as excited as I am to see this book is available in print again? What do you think, should I give away one of my copies? When I was at Pantheacon in San Jose last February, I bought some really cool original drawings from an artist named Laura Tempest Zakroff. (You can find her website here.) There was a painting of a black cat that reminded me of Magic that caught my eye first, but then, low and behold, I noticed that she had not one but TWO Baba Yaga pictures! The hut on chicken legs, and the Baba flying in her enchanted mortar and pestle. Then one of my friends online told me about a cool graphic novel that she thought I'd want to read, written, ironically, by a woman with a REALLY cool name: Marika McCoola (with illustrations by Emily Carroll). Of course, I bought it and read it immediately, and it is truly fabulous--a modern fairy tale about a girl who meets the Baba Yaga, with a slightly unexpected ending. The book is called BABA YAGA'S ASSISTANT (and here's a link, in case you want to check it out further). When I finished it, I immediately thought: I need to share this! So here we are, with a Baba Yaga themed giveaway to celebrate the fact that I just finished the final edits on WICKEDLY POWERFUL, the next Baba Yaga novel in my series (coming in February). I couldn't decide which one of the pictures to give away and which one to keep, so I'm actually going to let the winner decide! Go ahead and tell me in the comments which one you like best. Or, of course, if you'd rather have the book (although you get both). So, all you have to do to enter is use the Rafflecopter form to chose the usual options. You can share the contest on Twitter, visit my Facebook page (and click like and "get notifications" if you haven't already). You get extra points for leaving a comment, and extra EXTRA points for leaving a new review (or a copy of an old one in a new place, like Amazon, B&N, Goodreads, etc. ), or buying a book (old purchases don't count, although I do appreciate the heck out of them), any book of mine. Some options can be done on every day the contest runs. As always, no purchase is necessary, although if you want to preorder the new novel or the novella that comes out in January, Wickedly Ever After, or even the non-Baba Yaga urban fantasy coming out in November, VEILED MAGIC, now would be a good time to do so! Sunflowers in the garden. I planted them for the birds, who have already started working on them. Phllox and jewel weed. It really is a weed, but the hummingbirds love the little orange blossoms, so I don't pull it out. More phlox. This was here when I moved in, and it shows up in bits and pieces. Black-eyes Susans in front of the house. I planted a seed mix last year and this was what I got. Not exactly the mix of flowers I was expecting, but pretty. Anyone know what those purple flowers are? And lurking amid it all...the devil itself--RAGWEED! That last one is probably my least favorite plant in the world. (You can at least avoid poison ivy. The only way to avoid ragweed is to move to the damned desert.) I have been allergic to it since I was a kid. So yes, I bought a house surrounded on three sides by fields full of the stuff. Sigh. It's the spike-y tower-y looking stuff. Doesn't look like it could torture a person from the beginning of August until the first hard killing frost, does it? Tune in tomorrow, because there is another giveaway coming up!